This book can be seen as an extended case study in Christian social ethics. It is likely to prove controversial, since although the author has spent a long life working within the ecumenical movement, he is severely critical of the work of the World Council of Churches over the last decade and scarcely less so of much in Roman Catholic social ethics since the Second Vatican Council.In the first part of the book, after a preliminary portrait of the World Council of Churches for those unfamiliar with its work, Professor Preston gives an illuminating history of its activities in social ethics from the 1925 Stockholm Conference to the present day, and considers the relationship between Roman Catholic social teaching and that of the WCC, before turning to some current criticisms by others. This part ends with a study of the churchand its function in society. The second part examines responses in Christian social ethics to the collapse of the Soviet Union, the possibility of sustaining economic growth in a global context, and technology, humanity and the environment. It looks critically at some of the slogans tinder which the WCC has done its work, some of the theologies which have gained prominence and the whole question of method in Christian social ethics. A final chapter looks to the future in ecumenical social ethics, noting the present stalemate and summarizing the defects in recent documents, but also outlining a new programme and the possibility for reform.Ronald Preston was Professor Emeritus of Social and Pastoral Theology in the University of Manchester. 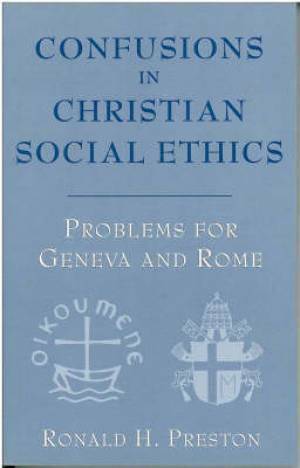 CONFUSIONS IN CHRISTIAN SOCIAL ETHI by Ronald H. Preston was published by SCM in October 1994. The ISBN for CONFUSIONS IN CHRISTIAN SOCIAL ETHI is 9780334025733. Be the first to review CONFUSIONS IN CHRISTIAN SOCIAL ETHI! Got a question? No problem! Just click here to ask us about CONFUSIONS IN CHRISTIAN SOCIAL ETHI.